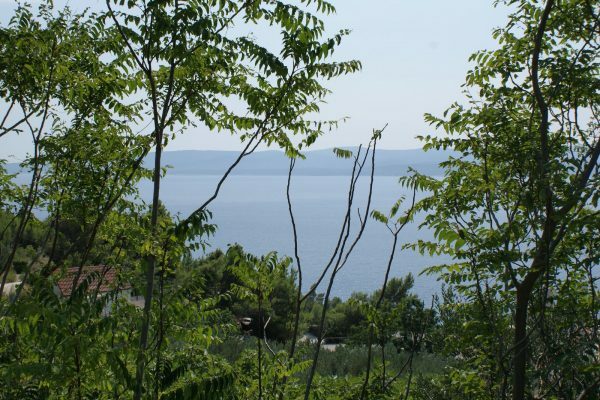 OM1379IV – Excellent building land for sale Omis has a total surface of 866m2, it is situated close to the sea and features amazing views of the sea. Its shape and position enable great building options. The building land for sale Omis has a rectangular shape with south orientation towards the crystal-clear sea and it is slightly elevated; thanks to this it is perfect for building a modern villa with open interior space and a lot of glass surfaces enabling lots of light and beautiful sea views even from the inside. The plot is very well maintained and placed not far from the main road, with all the connections right at hand – because of this you can start the building process immediately, which is a superb advantage. Another excellent advantage is that there is an access path leading directly from the property to the sea. This is a great, quiet area with just a few houses around, perfect for building a second home or a villa for rent. Omis area is a great zone for vacation, creating a second home and year-round living. Here you can enjoy various excellent amenities in the city of Omis such as excellent restaurants, bars, well-equipped beaches and wonderful historical heritage you can go sightseeing over and over again. Besides more popular beaches, this area offers many small, hidden beaches perfect for complete relaxation in the sun. Additional advantage of this area is that the city of Split is also nearby as well as Split International Airport with frequent flights to all important European destinations.